What does it take to engage successfully? My current job title is “Technical Leader for Digital Engagement” and, although the Technical Leader role has me perfoming a little like a CTO, the “Digital Engagement” part is to some just a collection of buzzwords. Nevertheless, we picked that title for a really good reason. So, what is “Digital Engagement”? Jasper Visser and Jim Richardson, at digitalengagementframework.com, define engagement as “activity that takes audiences, connects them with you and turns them into enthusiasts for your organisation’s assets”. I would extend that and say that in digital engagement, the activity is digital content combined with a digital platform such as a social media network or website, consumed by technology such as a phone or laptop. The audience could be interacting directly with that digital platform, or perhaps talking to an agent of the company that is interacting with said platform. In a way, it’s my role to help organisations use technology to turn their audiences – staff, customers, etc. – into such enthusiasts. So, how do we turn audiences into enthusiasts? 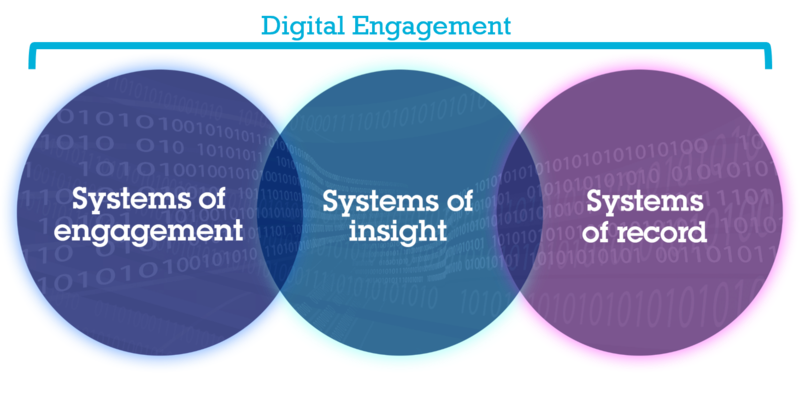 Digital engagement probably does start with the systems of engagement – the technologies that focus on people, not process, which include front ends that allow users to interact with an organisation. And we need to think about aesthetics, but more importantly about design (design is ensuring something works well, not that it looks good.) But I believe it takes more than systems of engagement to do the job properly. For example, to be sufficiently informed about an individual that’s interacting with an organisation it is likely that we will need to connect with the more traditional systems of record that hold details about the person and their history with said organisation. To accurately personalise and be personal we have to call upon systems of insight that can perform the analytics to support such individualisation, to make interaction relevant. As for the users who are to be engaged, well, they can be anyone: employees, consumers or customers, citizens, partners and so on. Furthermore, to engage those users properly may require capabilities outside of the boundaries we may unconsciously think exist for customer experience and for employee engagement. For example, in IBM we have a client that uses our smarter workforce technologies for workforce management but uses IBM Commerce message push technology to send information to employees – to better engage those employees. So, we have a convergence of tooling that is typically focused on employees with tooling typically focused on the customer experience. Similarly, qualitative and quantitative experience analytics of web sites are largely used to ensure the best of customer engagement but it can be equally as necessary within an organisation for provision of excellent employee experiences. I was at Scotland’s Digital Leaders Salon focused on User Experience and within minutes of discussion it became clear that user experience is not just about the web site or the app. We discussed government as an example, and how often if an individual (officially called a service user) needs to interact with a government department they are likely to need to interact with other departments too. Often these interactions provide rather poor experiences. There is not enough access to the right data, data is not shared between departments adequately, and users are often left repeating themselves to various representatives. If there was better access to the systems of record, and better analytics applied to the data, the levels of engagement and user satisfaction would be much higher. Have I forgotten IWD already? What does one do with a Barbie?